I was referred this job in North Devon by Holman Paints. 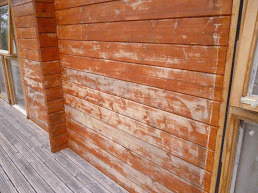 The potential customers were not very happy with the quality of the woodstain on the walls of their lodge. 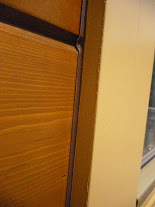 Also the lacquer on the doors and windows on the South and West sides had broken down in the sun, allowing moisture into the softwood leading to peeling lacquer and mildew staining in the wood. The idea was to fix the doors and windows, rectify the woodstain on the walls and paint sufficient maintenance coats of the same colour to make a lasting job. 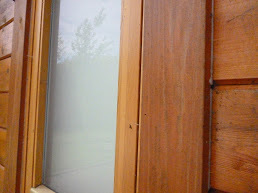 On visiting, I could see another problem was that the surround feature of the doors and windows had been badly sealed with clear silicone sealant, meaning that any coating painted on top would leave a visible sealant line. So at the very least the silicone would need to be scraped off, difficult to do without damaging the existing woodstain. 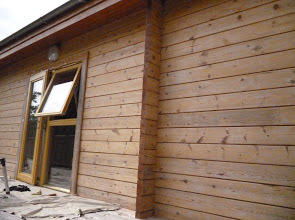 It was sounding less likely that the job would involve a quick maintenance coat of the same colour as existing, especially as there was some greyed timber on the bottom half of the log walls which would need sanding off. Sure enough, on the first day a wash down with a pressure washer confirmed my worst fears. 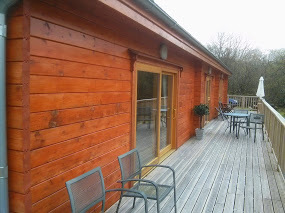 The original woodstain had either been very thin, allowing the sun to penetrate and degrade the wood underneath, or some time had passed between erection of the lodge and it’s painting, allowing the timber to go grey before painting over. Whichever, there was plenty of greyed wood uncovered by the pressure washer. This meant it was better to get the whole lot off. And unfortunately for my son Matt, there was a lot of sanding to get through! All this time, Holmans had been busying themselves concocting a match for the original woodstain colour to refinish the walls as before. However, the customers came down for a few days, saw the bare pine logs and liked what they saw! The light colour and general “woodyness” was much preferable. I explained that it is actually the pigment in a woodstain which protects the surface of the timber from the sun’s rays, and so there isn’t a readily available clear coating that would stop the sun damaging the wood. But I could do it with the lightest available woodstain colour – Light Oak – which I thought would also add a bit of tone to an otherwise slightly washed out look. Holmans recommended Sikkens Cetol WF771, a water-bourne low-build alkyd/acrylic stain which can be obtained in the standard Sikkens Light Oak shade. While this was going on, the doors and windows had all the varnish stripped off using a chemical stripper. Discussions about colours had settled on using an opaque system as the wood was so mildew-stained and the grain not very interesting. The request was for a colour similar to the original lacquered wood, so I opted for a slightly brighter BS08C35, mixed by Holmans in Otex primer and Valtti Ultra topcoat, all preceded with a coat of Valtti Base priming oil. The Sikkens was very easy to apply; the same stain serves as primer, mid and topcoats. 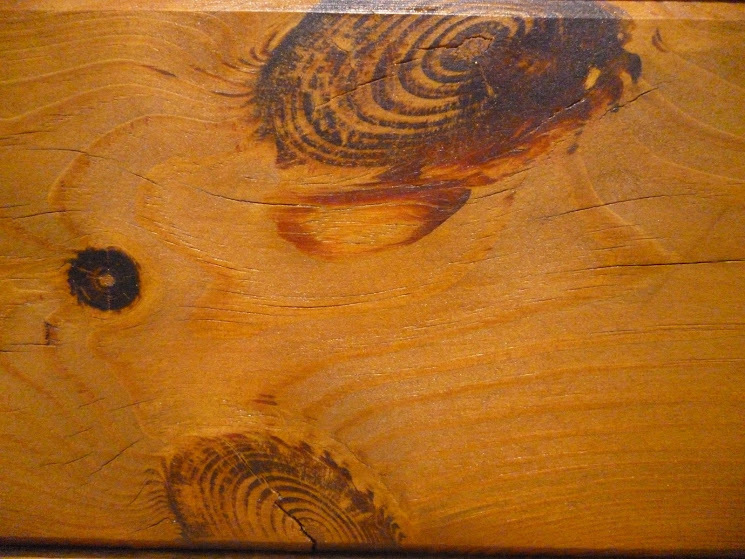 It acts and looks very like an oiled finish, brings out the grain well, and has a minimum level of sheen. The only downside is it doesn’t like going over any existing woodstain coating and really needs to be applied to bare wood.